There’s going to be a great afternoon out for all the family on Sunday 24th January when the renowned Mahidol University Jazz Orchestra gives an open air picnic concert at Phornprapha Botanic Gardens, not far from Siam Country Club. The concert runs from 4.00pm to 6.00pm and you can bring your own cushions if you want, because although seating is available, you may prefer to sit on the stone terrace that surrounds the natural amphitheatre. The jazz orchestra features more than thirty-five young and talented musicians and they will perform a variety of well-known jazz standards as well as pieces from the world of Latin-American music and popular music. Sponsored by Siam Music Yamaha, the concert will also include some much-loved songs composed by H.M. King Bhumibol Adulyadej. Mahidol University Jazz Orchestra (MJO) was initially formed in 2003 by students undertaking jazz studies at Mahidol University. It was conducted and directed by Dr. Joseph Bowman under the specialist guidance of Dr. Gene Aitken, considered one of the most exciting and energetic jazz clinicians today and recognized as a visionary in both jazz education and computer technology. The orchestra made its first public debut in 2004 at the auditorium of Siam Motors Building, the home of Siam Music Yamaha Co. Ltd. The orchestra has been continually developing its performing skills with various distinguished jazz conductors including Shuichi Komiyama, David Hart, Udo Van Boven, and Hashem Assadullahi. In 2007, MJO was honoured to perform at Taiwan’s Chiayi Music Festival, and nearer home played at Jazz in the Park with the MJO at Santi Chai Prakan Park on the eastern bank of the Chao Praya River. More recently, the MJO has participated in the annual Thailand International Jazz Conference. The band’s repertoire embraces compositions from world-class jazz composers such as Gordon Goodwin, Maria Schneider, Bob Mintzer, Bob Curnow, and saxophonist and composer Mark Taylor. 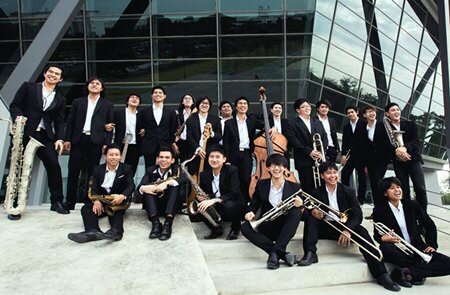 Mahidol University Jazz Orchestra is currently conducted by Taweesak Booranapanitpan. It’s an easy trip to Phornprapha Botanic Gardens. Drive out from Central Pattaya along Soi Siam Country Club (Soi Pornpraphanimit) until you pass Mabprachan Reservoir on your left, past the big temple on your right and then go straight on, under the red arch saying “Siam Country Club Pattaya”. From this point it’s exactly 2.9 kms on the same road to the imposing entrance to Phornprapha Botanic Gardens which is on your right. A little further up the road is the artificial railway station with a small empty train waiting there. If you pass it, you’ve gone too far. The GPS coordinates are 12.920408N 100.987761E.